Win a FREE week of Holiday Camp at Step Preschool! Home » Contests » Win a FREE week of Holiday Camp at Step Preschool! One lucky Long Island Loyalty cardholder will win a complimentary week of camp for one child (ages 2-10) from 12/28/15 through 12/31/15 at their state-of-the-art Eisenhower Park facility! HOLIDAY & SUMMER CAMP programs for ages 2-10. 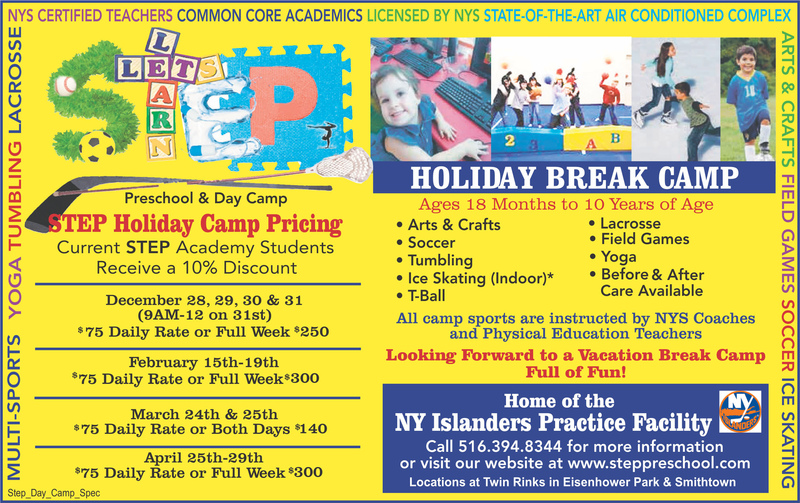 Children participate in a unique & innovative, age appropriate multi-sports environment which includes soccer, lacrosse, tumbling as well as ice skating lessons on the NY Islanders state of the art ice rink (Eisenhower Park location). If you don’t have a FREE Long Island Loyalty card yet, click here to sign up. Entrants who do not have a LI Loyalty card or who have not signed up for one will be disqualified from the contest.